​Shelley Thorstensen was born in 1953 at Fort Sill, Oklahoma. As a child she lived in Salzburg, Austria and Stuttgart, Germany before moving to Cherry Hill, New Jersey. She has taught printmaking at numerous colleges including Rutgers University Camden, Minneapolis College of Art and Design, Marywood University, Keystone University, Moore College of Art and Design, Mason Gross School of the Arts of Rutgers University, University of Delaware, Muhlenburg University, Tyler School of Art of Temple University, and University of the Arts. She currently lives in Oxford, Pennsylvania where she is the Director of Printmakers Open Forum. 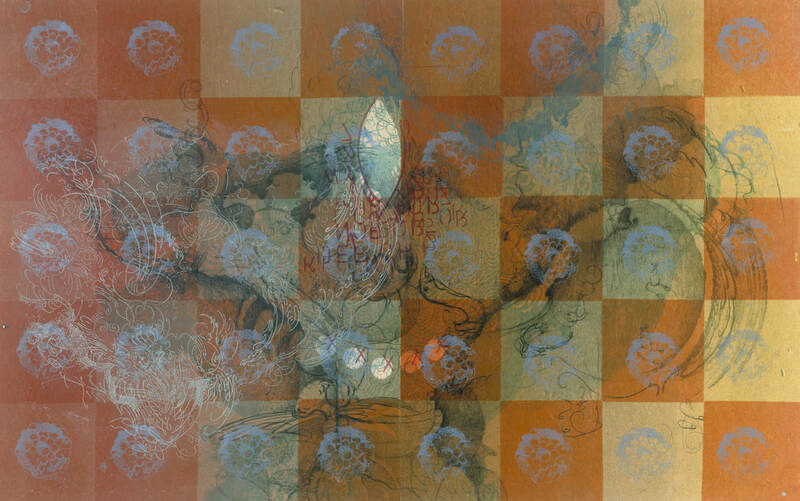 Thorstensen's work has been described by Edward Sozanski of the Philadelphia Inquirer as “romantic abstraction” and that her prints are “for the most part palpably emotional effusions”. Artist Michelle Wilson writes "Each piece by Thorstensen is not a single experience; instead it is a concentration of ideas, encounters, and emotions. Her conceptual roots are in nature and its experience, but go deeper than everyday reality. Viewing her work, one winds through a labyrinthine configuration, where process, pattern, and lines become conduits and psychopomps in her visual idiom. Thorstensen presents in each piece a simultaneity of linked consequences, twists and turns of the journey of the soul". Thorstensen explains “I see my work as a direct expression of consciousness, as in a feedback loop where the bilateral symmetry of the plate to print directly reflects my body, my imprint. I see it as a method to look at myself in a mirror, a psychological means to literally face myself while making work". Thorstensen has an undergraduate degree in Experimental Studies from Syracuse University, School of Visual and Performing Arts, Syracuse, New York and a graduate degree in Printmaking from Tyler School of Art of Temple University, Philadelphia, Pennsylvania. Her work can be seen at Dolan/Maxwell.